Best inner tubes on the market. Super light weight and good value for money. Best option for reducing rotating mass without sacrificing reliability. I use these on all my road wheels and have seen no increase in punctures. These tubes are very light weight and do a good job of holding air with minimal loss of pressure after several days. Other tubes I have used have been heavier and lose air quicker. As it says on the box, only 65gm but the same reliability as regular 110gm tubes. Light but pricey. Flatted often with Conti 4000's, hopefully will not do so with new Gatorskins. Good quality and light tubes. Won't use any others. My preferred inner tube. Not fragile like the Continental SuperSonics, and not carrying the excess weight of standard tubes. Just right. These tubes are light and easy to install. The valve seems robust and durable. 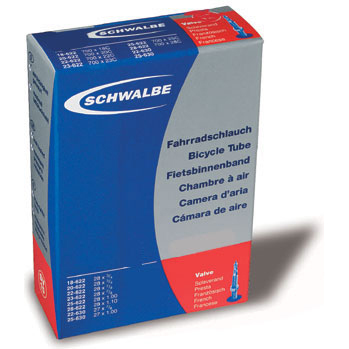 I got these tubes because their compact size makes it easy to fit in a saddle bag/pocket. They are half the size of regular tubes. Good tubes - light, roll well and okay puncture protection. Only downside is having to inflate them more often than heavier tubes, oh, and they are expensive. These are good quality tubes. These are light, and perfect for racing if you`re on clinchers. Punctured one on install. Seem to do the job once they are in. Light light tubes and a great combination with the new Schwalbe Durano Raceguard I have just purchased. A must if you are looking to cut down that extra bit on weight. Bought these for my time trial bike which I use at 140psi they are light but reliable at these high pressures. I've used latex tubes in the past but had failures at these sort of pressures. These are fun time tubes. The way I look at it, if a thorn penetrates your tyre its gonna get a puncture with these on. So just carry a spare as I always do and enjoy the ride. They are air tight and couple with light folding tyres put them on the lightest rims (hubs are irrelevant) you possess and fly up them thar hills! Great for invigorating a heavy old steel bike with some nice hoops and tyres. One Of The Best For Races. Lightest tubes on the market. I run X- Light tubes on my MT bike and love the weight saving on roling resistance. Will never go back to other brands.